San Diego took advantage of Andy Dalton’s three turnovers in the second half on Sunday, pulling away to a 27-10 victory that extended the Cincinnati Bengals’ streak of playoff misery to 23 years and counting. 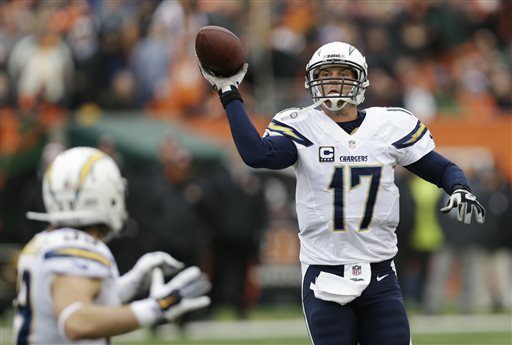 Philip Rivers donned gloves and made accurate throws in the January rain, leading the Chargers (10-7) to their fifth straight win, this one over the last team to knock them off. They’ll play next Sunday in Denver, the AFC’s top seed. It was a shocking finish for the Bengals (11-6), they won the AFC North, went unbeaten at home and had their top-ranked defense for the playoffs. With everything in their favor, they fell apart, getting outscored 20-0 in the second half. Dalton now has a trilogy of bad playoff games. He fumbled and threw two interceptions in the second half, setting up San Diego’s first playoff victory on the road in an open-air stadium since the 1994 AFC title game in Pittsburgh.